Locally owned Paradise Cruises is putting all available resources to bring a truly new cruising experience while setting new standards with an Internationally leaded team, spacious and smart designed cabins, and panoramic view balcony on selected cabins and exceptional personalized on board service. Paradise Cruises is proud of being the perfect product of luxury and is dedicated to provide all the necessary tools to achieve her goals such the possibility to organize private luxury car or helicopter transfer from any destination in Vietnam direct to our brand new Exclusive Private Pier facilities on Tuan Chau Island. Paradise Cruises is also the perfect choice for a private or corporate event such as anniversary, product launching or seminar through the dining room and sun deck areas conversable into a conference room, cat walk or a gala dinner cruise. 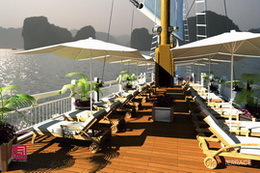 The maiden voyages of the two brand new 17-cabin wooden Junks are scheduled for early September 2008. 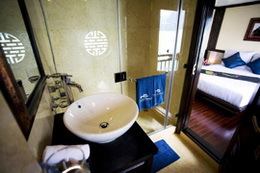 Two days/one night as well as three days/ two nights cruises will be offered. Paradise Cruises is committed to accommodate in the measure of possible and with an appropriate advance notification any dietary and/or religious meal. The dining room adjacent Bar’s is providing a relax atmosphere ideal to seep an elaborated or classic cocktail before dining or a refined night cap. The open wine cellar is providing an enchantment for the eyes and the palate of any connoisseur or wine lover. Special request such as in room dining or cocktail party are not special at Paradise Cruises, the crew will be enchanted to please.